Courting controversy: is voice control welcome on Windows Phone? Master Chief saved Xbox, but can his little helper rescue Windows Phone? You know that thing on iPhone that no one uses and isn't very good but Google copied it anyway? Microsoft's gone and copied it now as well, with the tech giant revealing that a voice controlled "personal assistant" is a key part of of its Windows Phone 8.1 update. Named Cortana after the AI who helped Master Chief eradicate all those tiresome aliens in the Halo franchise, it offers much the same thing as Apple's Siri and the various voice tools that Google's stuck in Android. On paper, men in expensive T-shirts can now book themselves sushi in San Francisco using only voice input, as if we live in a world in which voice recognition software is actually any good. 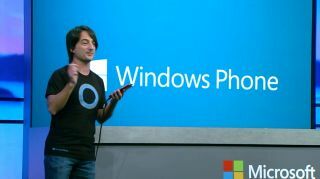 Microsoft's own demonstration of Cortana at the WP 8.1 launch inevitably stumbled a few times as she failed to recognise the Windows Phone man's voice input several times, much to the amusement of the audience. And much to the amusement of everyone on the internet too, who activated their voice controllers simultaneously to shout "We told you it wouldn't work" in unison. "Checking for Segway hire in North Wales"
The video games sites, ever eager for anything, literally anything, to write about, were able to talk about this, seeing as Cortana's from Halo. That's why Gamespot did something about it, where, eventually, someone was really positive about it all, with reader linfo28 suggesting it was a "...reason to get a Windows Phone!" His unnatural enthusiasm was queried by Console_War_Vet in response, who asked: "A voice assistant is a 'system seller?' I've always seen it as more of a gimmick that I'll probably only use a few times, but whatever floats your boat." Kevin Bradley then butted in to sing the praises of Siri and the concept of phone whispering, saying: "I'm an iPhone user (not being a fanboy, hear me out) and use Siri for setting alarms and timers, checking the weather, and sending text messages while driving so I don't have to look away from the road, as well as voice dialling and playing tunes in the car. If you drive much, it's very useful." To which Mr War Vet answered back: "I've honestly never seen Siri being used in a legitimate manner. Most friends and family with iPhones just try to get 'her' to say lewd things." Over on The Register, commenter Martin Budden said: "I think I'd quite like a phone assistant with a male voice similar to KITT (the 1982 version, of course). A sort of wise and friendly butler-ish voice." Kristian Walsh is more concerned about how it handles his thick regional accent, saying: "As the only use I'd have for voice control is to send texts to people while driving, I'll get interested when it does something intelligent with the Irish and other non-English names in my phonebook. 'Intelligent' means asking me how to pronounce them when it doesn't know (or gets it wrong)." Destroy All Monsters took his fury a little further, suggesting: "The whole anthropomorphization thing of a search algorithm is childish and annoying. Giving it 'female' attributes smacks of someone who doesn't understand that the target audience is not the young male adult gaming/movie audience. FFS!! MICROSOFT FAIL!" On Cnet, reader Jessica Stevens made a good point about Cortana's weird gamer legacy, pointing out that: "It's funny, and sad, that Microsoft has the virtual assistant in fiction 10 years before Siri, then plays catch-up to Apple in reality." It was lost on commenter MackKnife, though, who's obviously not spent the last decade smashing through various Halo games, who asked: "What moron came up with the name Cortana? While not to disparage anyone with that name, where do people dream up names like this for products or services? Did everyone have to fall into the mindless Intel way of naming products and technologies?" It's from a game thing the kids like, Mack. He continued with the more valid criticism of: "Not an Apple fan but at least they know that two syllable names work like a charm and after that no one gets it. Microsoft knew something at one time because they didn't name it 'Windowsframe' or something inane like that." Readers on MacRumours were surprisingly positive about Cortana on the whole, using the comment thread to talk about how useless even some Apple enthusiasts find Siri. Although those who've put "Cortana" into Google image search (or the Bing equivalent) are a bit worried about how the naked blue lady of Xbox past will translate into today's slightly less sexist about everything world. Brian Victor said of the choice to use the Halo AI character's name: "Maybe they are pandering to a younger male crowd because virtually every male under 40 probably has played Halo by now. By the same token, I wonder how this will go over with the female demographic. Cortana's avatar is, well, a bit risque." She was designed back in the early 2000s, Brian, before women won the right to be allowed to hold video game controllers and put things on the internet. It was a different world.